Diggers Valley: 26 January 2008. The week beginning the 26th of January 2008. 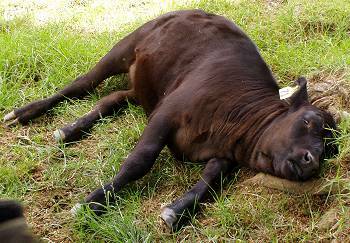 Imagen 33's calf was fast asleep by the gate out of the Swamp/Frog paddock lane. She was obviously dreaming - she was twitching, with her tongue continually moving around. They also often sleep with their eyelids partly open. The days are so hot now that I opened a gate for these cows to enable them to go through into the Windmill paddock where there are trees underneath which they can rest. Most of them didn't bother to move, spending lots of time lying around in the sun. I don't know how they don't cook. This evening we were just finishing weighing some of the calves when Jude and the three children arrived for another stay. While Jude took the two boys home to get dinner ready, Stella stayed with us and we shifted the cattle up the road to the Road Flat paddock. By the time everyone was organised for bed, it was quite late. The children aren't usually able to do things after dark in the summer time, because it gets dark so late, so I thought I'd take the opportunity to take Stella out for a quick in-the-dark adventure before she went to bed. I've been continuing my late-night cow checks on the insemination mob all through the mating period, so Stella and I went out to do that together, hoping we might also happen upon some possums to look at. There weren't any possums, but we did find a hedgehog and heard a lot of Moreporks (Ruru, the native small brown owl). Then we walked down to the bridge and looked into the water and saw a lovely big eel and the bright red-sparkling eyes of the little shrimps in the water as we shone the torch on them. Irene 698 looks like she's not pregnant - too much mucous starting to appear and she called in a way which suggested she was on the hunt for a suitor earlier today. This evening she's quiet but I think she's about to come on. Her due date for the next heat is Friday, but she could be early. Irene will need a visit from a bull (I don't want to risk getting the timing wrong again for another insemination), so I moved Ivy and Isla and bull 54 to the neighbouring paddock, ready to pop him through when necessary. #54 has been my 'moveabull', being drafted out of his mob so they could join that of #49 last Thursday, spending a few days with Isla to cover her possible return to heat today, and now about to go off to deal with Irene. Jude went to look at a house for sale up on the ridge opposite the end of Takahue Road, and I took some photos looking back towards Diggers Valley. The range on the right is the Herekino Forest, with the dark patch of the big Pines up behind our place. In front of the big range and to the left of those pines is our little patch of pine trees (in the Pines Paddock). At the left edge of the picture, just under half-way up from the bottom is the junction of Takahue Road and the main road (State Highway 1) which runs North to Kaitaia, straight along to the right. Back at home all was quiet in the Road Flat paddock where we stopped off to check the cows and #49 bull. 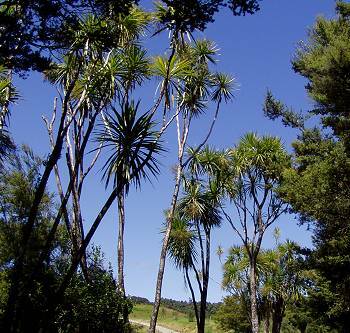 The Cabbage Trees look fantastic in the summer sunshine. Some of the trees along the road here have died, but most remain green and healthy. Isla being clean and quiet still this afternoon (and therefore presumably safely pregnant) I put bull 54 through with the Insemination cows to spend some time with Irene. Irene, quietly grazing with a very red and grubby indicator on her back, has obviously been mated overnight. Let's hope that one works! Jude went off with only Louie this morning, leaving Stella and Jasper with us. I needed to go out and hunt down some more ragwort, so Stella and I packed a bit of a picnic, covered ourselves liberally with sunblock cream and insect repellent and took the ute out to the Bush Flat paddock. We parked it under some trees and walked up into the Big Back Paddock, where I've already done a number of hours of Ragwort hunting, and know there is much more yet to be done. 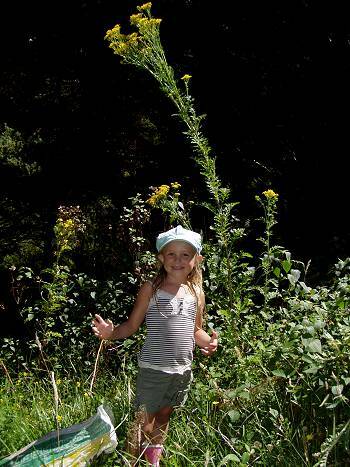 Some of the Ragwort plants are ENORMOUS. This one was growing in a little clearing where the plants were tending to grow up for the light above. The plant was over seven feet tall! 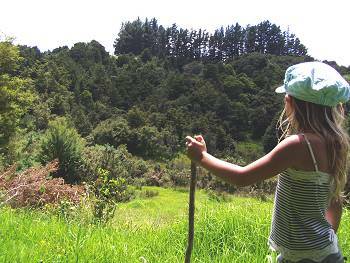 Stella was a great sneaky-Ragwort spotter - the plants are often flowering in amongst the low branches of Totara, or in the long grasses where one might not see them without careful checking. I did all the cutting and pulling of plants, leaving Stella to concentrate on getting around the difficult terrain, which included learning about how to get through blackberry plants without getting too caught up. We eventually got tired and hungry, so sat down in the shade for a rest and told each other stories and listened to and watched the birds for a while. Then we made our way out to the track and back up the other side of the swamp to look back to the bushy hillside we'd been walking across. From there we could soon see the ute at the bottom of the hill, so Stella ran ahead down the track, calling back all the while, to make sure she was going the right way. We had our small picnic in the shade under the trees by the stream, and then went home for a bit more lunch. I like doing this sort of thing with children - it's way outside their usual experience and I think they learn some useful self-reliance when expected to be brave and sensible in new environments. Stella was at first quite perturbed when she couldn't see me as we climbed around in the gullies hunting the ragwort, but I could sense her growing confidence as she worked out how to find me again as we talked back and forth. She knew I wouldn't be able to come back and rescue her constantly if she got caught in the blackberry, so she took care and worked out her own escapes. We both enjoyed ourselves a lot. Stephan and Jasper had spent their time in the shed getting ready to build some more deck chairs. 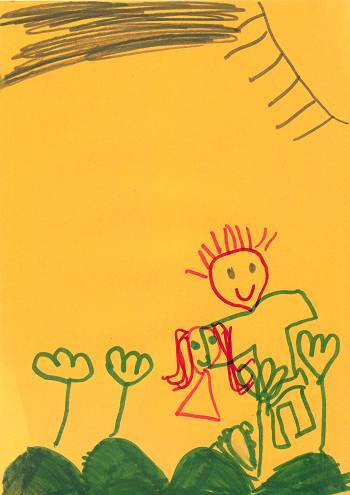 Stella drew this picture of the two of us picking ragwort in the sunshine. 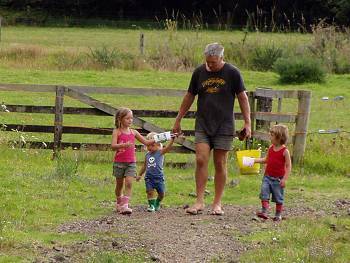 Later Stephan took the three children out blackberry picking so he could start making Blackberry Jelly. 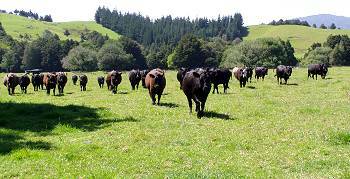 We all went up the road to round up the cattle in the Road Flat paddock and bring them back to this side of the river. I seem to have been infected by some nasty lurgi in my throat; probably from a small snotty-nosed boy I kissed a couple of days ago! I really feel quite unwell. Feeling ill and moving very slowly this morning, I spotted an opportunity to open a gate for #54's cows and let them out of the paddock before he noticed they were leaving (he was busy grumbling across the lane at the other bulls in an adjacent paddock). Then I brought those other two bulls up the lane and put them in with 54 and so there was a big fight! That went on for about twenty minutes before 54 proved he was stronger than 55 and things settled down. We are now at day 43 of the mating period. Most of the cows and heifers are pregnant. I am combining the mobs of cattle, partly because that'll make management easier and also because with young untested bulls I want to be sure I haven't run into any problems with their fertility. Bull #49's cows came on heat early and because they've not done so since, I know that he's fertile and is doing his job. He also has a number of traits I like, so he's ended up being the preferred bull to finish the mating season and catch any last-minute hot cows or heifers. 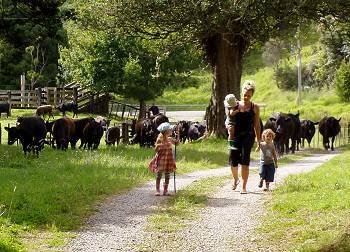 Late in the afternoon we brought #43 and his mob in to the yards to do the last of the calf weighing. Jude and the children watched from an empty yard while we worked. We have one very problematic little calf this year, the brother of a similarly difficult calf last year: #58 is the son of Dot 30 and he really doesn't want to be anywhere near us. I think we'll have to shoot him and turn him into mince. I doubt he'll be worth eating as prime beef, being so utterly mad and probably tough as leather. I won't sell him because I want only to sell quiet cattle which I expect won't cause problems for people, not crazy yard-breaking monsters! Dot, for all her wonderfully impressive EBVs, is on the cull list this year, this being her second stupid calf. I blame her sire, since all the calves I had from those straws have been jumpy and while Dot has calmed down a lot, her calves are obviously getting the wild genes. After we'd done the weighing, we drafted most of the cows and calves out of the yards and back to where they'd been grazing during the day and left four cows (and their calves) with the bull. They are the ones which either came on heat late or are due for their three-week return (if not pregnant) in the next few days. This is just an intermediate step for them on the way to joining the other bull mob and #43 being drafted out tomorrow. The calves are doing quite well. The male calves average 171kg, with the heaviest just over 200kg and the heifers average 156kg, the heaviest being 180kg already. For most of them this was their first trip over the scales. In most years they'd have been weighed at least once - probably twice - by now, but with the demands of my exam manager job last year, I had to let some jobs slide. I've collected so much data on the calves over the years that I think we can cope with a little less this time around.